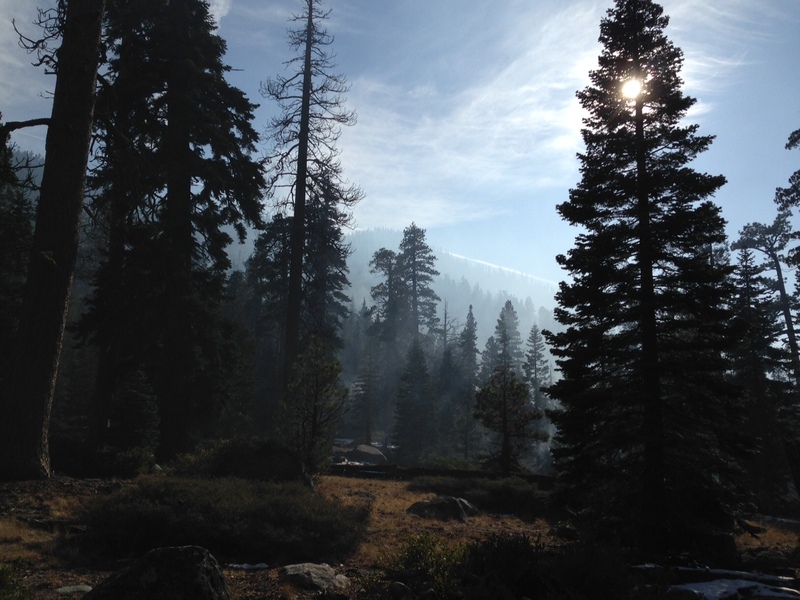 The Meeks Bay trail is one of the easiest and most popular routes into Desolation Wilderness. At just ten miles south of Tahoe City, it is also the closest trailhead into Desolation if you are coming from Truckee or North Lake Tahoe. While the five mile tromp into Crag Lake is certainly a worthwhile endeavor, Meeks Bay can also be a perfect locale for an easy walk before the snow gets too deep. I headed out on the Meeks Bay trail on a brisk Saturday afternoon. The first mile is almost level, and follows the sandy surface of an old dirt road. In about a mile, the dirt road reaches a junction. The trail into Desolation Wilderness heads uphill on single track to your right, and the the road continues straight ahead and stays in the meadow. From this junction, if you go straight, the road peters down to trail, and soon reaches the remains of Camp Waisu, a former girl scout camp. All that is left now is the concrete foundation of the main building, and a few ancient latrines with all the walls and roof gone, but the seats still proudly waiting for a posterior to come along. If you stay on this trail, you soon reach Meeks Creek. You can turn around here, or cross it and follow the creek downstream back towards Lake Tahoe. Tucked up against the north facing moraine of the edge of the valley, this side of the valley is moister and more lush than the main trail. On my trip, a controlled burn was in the process and the valley was full of smoke. 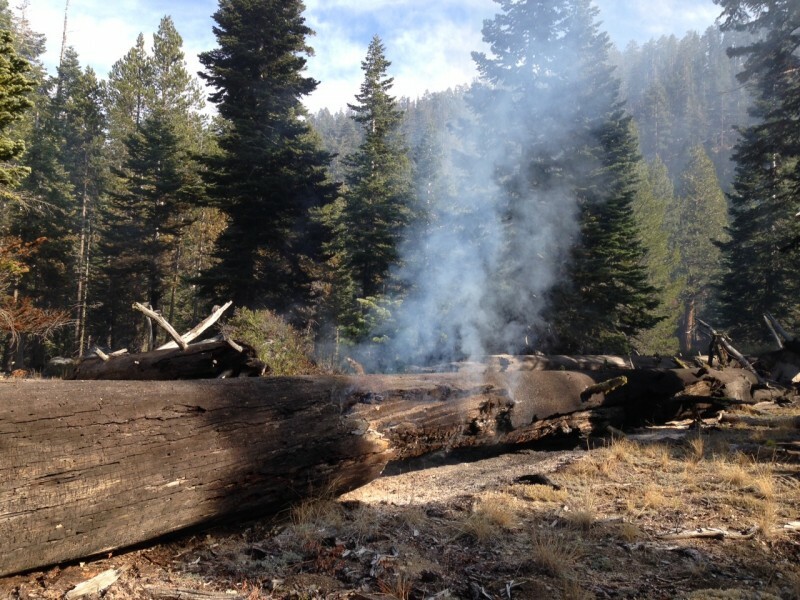 I passed several smoldering dead trees and the smoke gave off a fun, eerie feeling. I should have come here on Halloween. Eventually, the trail hits a dirt road, which then meets a paved driveway, which bring you to dirt trail and back to the highway, just a 100 yards south of the main trailhead. To get there: Take Highway 89 (West Lake Blvd.) 10 miles south of Tahoe City, the trailhead is on your right at the big turn in the highway. « There’s Still Time to Visit Apple Hill, CA! Fun for the Whole Family. You are encouraging trespassing through PRIVATE property. Trespassing is a crime. Do NOT not encourage people to trespass the ‘loop’. There are private property signs visible from the gate to the HWY. The US Forest service, sheriff’s department and local fire department are enforcing the private property. The sheriff is authorized to act on trespassing. The forest service is in the process of relocating the last ‘leg’ of this so called loop through the power line of their property. PLEASE RESPECT PRIVATE PROPERTY! REMOVE THIS ARTICLE or change the last leg to follow the power lines to the road on a single track dirt trail. This loop is only recommended during the summer otherwise you are harming endangered wildlife. Also who wants to trek through mud? I’ll copy your comment and direct it to the person who wrote the article. I haven’t hiked there myself, so I’m clueless as to the area in question. Thank you for your comment.